Official sales numbers were just released today and as expected record sales lead to higher prices and lower inventory in SW Florida real estate market. 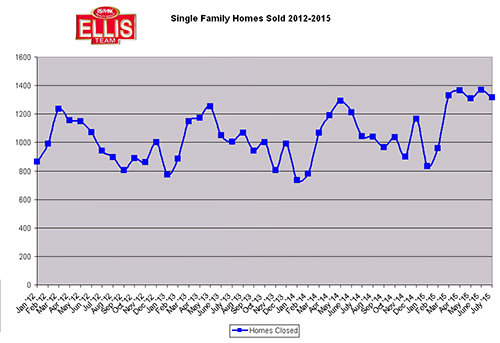 Single family home sales were 1,315 which were a 26.2% increase over last year’s numbers. 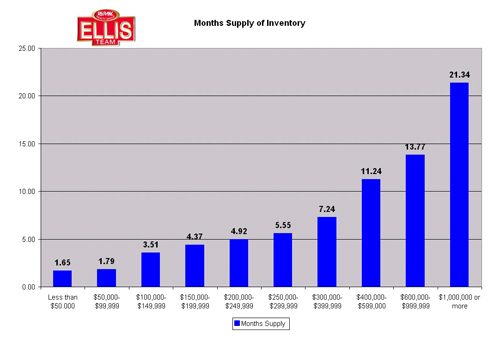 Keep in mind our inventory levels stand at 4,311 now compared to 4,918 last year. We’re down 12.3% in inventory and sales are up 26.2%. It’s no wonder there has been upward pressure on prices. New pending sales were up 6.3% in July in what could be a good sign for August and September closings. Total pending inventory was down 2.9% but that doesn’t mean much. Last week we reported unofficial sales price numbers and we said the official numbers were going to be good. They’re even better than we reported and we’ll feature that in next week’s article. Our buyer specialists have been very active in this market. We’ve recently landed several homes for our customers. In a low inventory market the secret is getting to them fast and finding where the hidden pockets are. We’ve identified several listings that are mis-categorized in the MLS by the listing agent so they’re not getting the traffic they should. This generates opportunity if you know where to look. If you’re a seller you don’t want this but as a buyer you look for opportunities wherever you can find them. We also look for recent price reductions. Sometimes sellers are over-priced and when this happens the property will not sell. A property is freshest to the market when it first comes on. After about 21 days on the market it gets passed over. This can be unintentional. Buyers subconsciously feel the home is stale to the market and figures it’s over-priced or something is wrong with it if it doesn’t sell in first month or so. Some of these listings get forgotten about. While it is better to price correctly upfront, some sellers have to test the market, or perhaps they’re not as motivated Day 1 as they are later. For whatever reason the property sits on the market, and when the price is reduced it’s not always noticed. Buyers looking in that neighborhood see the sign, but they no longer call on it or check up on it after awhile. They lose interest. That’s why our MLS search site is so important for buyers. When a buyer saves a search the system will email any changes in that search result. If a new property comes on the market, our buyers find out about it. If an older listing reduces their prices, our buyers know right away. It’s a great way to stay on top of the market and beat out other buyers to new or changed listings. In a low inventory market, these tips can produce big results. Four of our buyers in the last month scored the home they were shopping for using one of these techniques. Technology is great, but there is no substitute for meeting with a great agent and sitting down and going over your needs. Buyers are frustrated out there and they’re calling us because they’re tired of losing out on homes. While we can’t guarantee to get you your first choice in a multiple offer situation, we can put your offer in its best position by using a few inside tips we’ve developed over the years. Put our team’s experience to work for you. It could make the difference between owning your first choice or your 5th choice, and not owning one at all. We’d hate to see you rent another year. Rents have climbed so high many times it’s more expensive to rent than to own. Visit our SW Florida MLS search site and our phone is 239-489-4042. Lets us know how we can help you! Check out our Featured Property of the week. 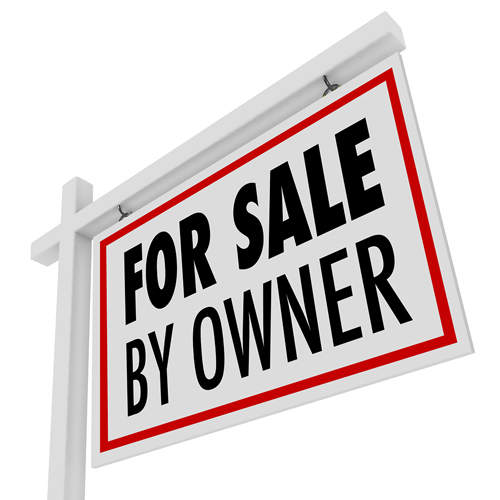 Of course, feel free to call us at 239-489-4042 We’ll be glad to help you buy or sell. Good luck and Happy Selling! Posted in Cape Coral Real Estate, Fort Myers, Fort Myers Real Estate, Southwest Florida Real Estate. 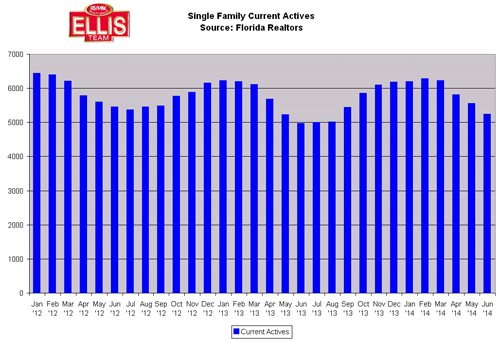 SW Florida home sales climbed in March to 1,068 sales for single family homes. This is down 7.1% from last year but up 37% from February’s home sales figures. We would say this is good news for the local real estate market as sales are holding up nicely. We think they could have been higher if there were more listings on the market ready to compete for buyers. In speaking with several real estate agents and new home communities it seems that buyers this year watched the huge price increases we’ve seen over the past few years and many decided it was time to consider new construction. For many years new construction was priced out of the market because existing homes were far less expensive. Existing homes were undervalued and new home construction basically had to sit on the sidelines or risk building at a loss. With the recent run-up in prices builders can compete again. This will be news for many sellers in SW Florida as they’re not used to competing with new construction in many years, but those days are back. Our market was undervalued and had to rise. Now that it has, competitive forces come into play and will temper large price increases going forward. We may be back to a normal market where we’ll be watching indicators that may affect our market like supply and demand, along with inflation, the economy, interest rates, consumer confidence, insurance rates, and others. All these forces affect the local and national market. Because we’re no longer undervalued by a wide margin, and because free money is leaving the scene, and flood insurance rates may rise, the market now must react to natural market forces. We were insulated the past 5 years. This market wasn’t a lot of fun on the way down, although it was fun on the way up, but now we’re getting close to market equilibrium. There is still much room for market growth, but it may need to be sustainable growth based on reasonable market factors. Most agents would agree it’s actually kind of healthy to get back to a stable growing market. Even in a stable growing market there will be pockets of sub markets that will thrive and some may struggle. Some areas of town will be hotter than others. Some subdivisions are still fighting off remnants of short sales and foreclosures, or the association is making up deficiencies left by members that didn’t pay. Some price ranges have less supply and more demand, and vice versa. You cannot price your home by how the overall market is doing, just as we can’t price SW Florida based upon how the National market is doing. If you’re considering selling, it pays to consult an agent who understands the market and what is really taking place. You don’t need an agent that simply reads the headlines and prices your home based upon where they heard the market is heading. By the time you read about it in the papers or see it on TV, chances are the market has already shifted. The market rarely stays in one place for long. We’ll make sure you understand the market forces so you can make a good pricing decision, and you’re going to love the new program coming soon! Posted in Cape Coral, Cape Coral Real Estate, Fort Myers, Fort Myers Real Estate, Reflection Lakes, Southwest Florida Real Estate. Sometime today the Ellis Team YouTube channel will reach the 200,000 view mark. We thought it might be a good idea to recap some of our top videos over the past few years that has drawn our team so much attention. 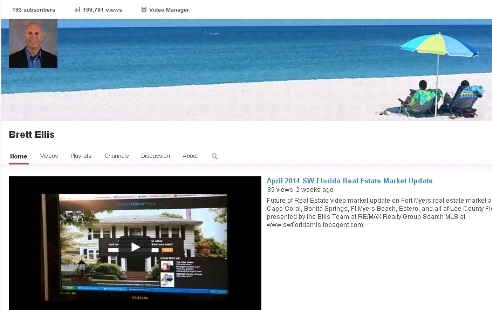 Our latest video is our April 2014 SW Florida Real Estate Market Update where we update viewers on some current changes we’re seeing in the market. Prices have been rising however there may be some surprises on the way when new March 2013 official sales numbers are released later this month. Our most popular video of all time is the Fort Myers Beach-Sanibel Island-SW Florida Video we posted in September of 2011. It is a fantastic video about the Fort Myers and Sanibel Island beaches and is a great overview of the Islands. A fun video we did was when Hillary Clinton was running for President of the United States. She commented on a story we did for the Today Show about how Florida would vote and how real estate was affecting the vote back in the 2008 election. Some people really like our client testimonial page Dex put together. A lot of agents nationwide appreciated our Split Screen commercial where we showed all agents are not alike. Still others really liked the Innovative Sales Techniques story NBC-2 did on our team and how we sell homes versus the competition. Let us know your favorite video. There are over 150 to choose from. Most of all, thank you SW Florida for making us one of the most watched YouTube Channels in SW Florida. Does It Matter Which Agent I Hire to Sell My Home? Aren’t all agents the same? Isn’t it just a matter of posting my home on MLS and someone will sell it? Does It Matter Which Agent I Hire to Sell My Home? These are common questions sellers have. The answer is choosing an average agent could cost you thousands, and choosing the wrong agent could cost you even more. You can be legally responsible for the actions of your agent, so choosing an experienced knowledgeable agent can make the difference between selling and not selling, or even a lawsuit. All agents do not work the same. In fact, some agents don’t even work much. Some agents treat real estate as a business and don’t have any other jobs. Their sole income is derived from working with buyers and sellers. Some agents even invest money into their business by advertising more, sending out mailers, online advertising, etc. Sure, sometimes the broker pays for this and splits up the services amongst all their agents, and sometimes the agent pays for all this. Some agents attend seminars out of town to learn from top agents throughout the country, and others stay home and listen to agents in their office complain. Education is an investment back into the business that can pay dividends for your clients. Some agents take their broker provided advertising and that’s really all they do, while others spend their own money and really promote their listings. Some agents hire assistants to help out with tasks that could bog a busy person down freeing their time up to close more sales while some agents spend time doing tasks that are not a productive use of their time. Some agents get a better price for their sellers’ homes because they are better negotiators, and because they expose the home to more buyers. Some agents over-price homes just to get the listing ensuring the property sells for a lower price later on versus a higher price sooner into the listing. Sometimes the over-priced home doesn’t sell at all. Often times we generate multiple buyers for a property. Choosing the best offer usually takes an experienced agent to evaluate all the fine details of the offer and read into the situation. Wisdom and experience are invaluable at this stage. Less experienced agents many times accept the highest price without regards to whether the buyer can actually close and what pitfalls might be involved rather than asking questions and perhaps countering the stronger buyer. When asked the following question “Can hiring the wrong agent cost a seller money?” I think it was Shakespeare who replied “Let me count the ways!” OK, so maybe Shakespeare didn’t answer that question but if he did that answer would have made sense. There is a big difference between the skills of agents, and there is a remarkable difference in the ways agents present homes to the public. I remember sitting through a class taught to Realtors on how to convince sellers that advertising doesn’t sell homes. Today I came across a website by a local broker and he was stating those same reasons on how advertising won’t sell your home, presumably because he doesn’t invest much in advertising. We’re currently tracking dozens of sellers who listed with less experienced agents, sometimes at inflated prices, and their homes are still on the market. They’re locked into listing agreements and they regret their choice. The time to really ask questions is upfront, and make sure you ask probing questions to seek answers, not to hear what you want to hear. Everyone likes to choose people based upon who makes them feel good, but in real estate feeling good is best defined at the closing table, not who lists the home at the highest price or tells you what you want to hear. If you list your home and go to the bother of keeping it clean so people can march through your home at anytime wouldn’t it make sense to work with someone who can shorten that process and get you top dollar, not bottom dollar after the market has rejected your home because it was over-priced? If you have a home to sell, give us a call. We’ll give you the facts so you can decide, and we’ll get your home sold for top dollar! Not Peter Pan money, but real money! When the headlines come out in a few weeks experts will be talking about how sales prices are up over last year’s numbers, and that would be true. 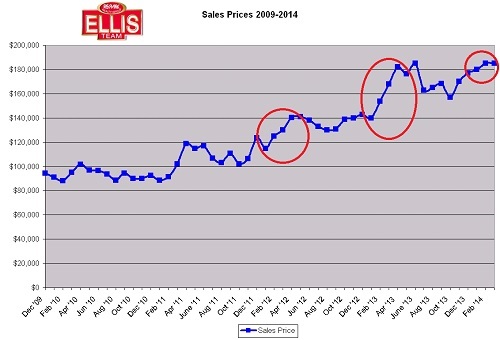 At the Ellis Team we like to study the market and identify trends for our customers, and today we’ll pass that along to you. Fort Myers Real Estate Prices and Cape Coral Looking Flat. We first reported some possible trends we’d be keeping an eye on back on Feb 26th in a blog post Are SW Florida Real Estate Sales in Trouble? Again last week we wrote about some subtle changes we’re seeing in the market. 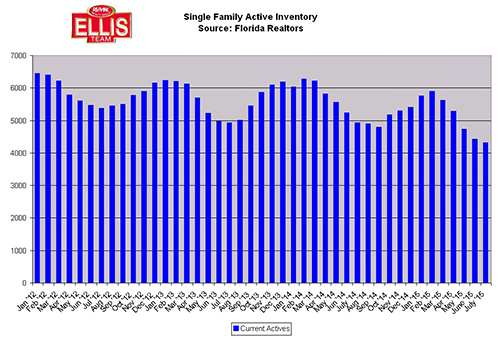 Listing Inventory Rises Slightly in February, Sales Increase- Is the SW Florida Real Estate Market Changing? Today we’d like to talk about some pricing trends we’re seeing. 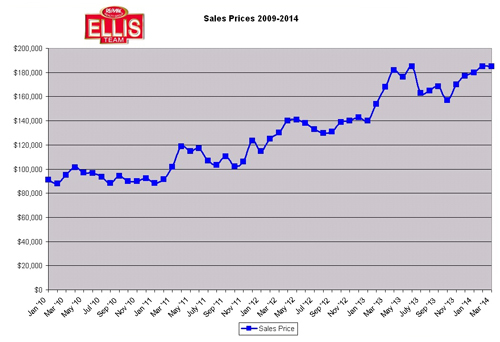 I pulled up March 2014 sales data the morning of April 1. Keep in mind it takes many days for some agents to input closings into MLS after they close at the end of the month. Not sure why, but it’s been a reality for years. Based upon preliminary numbers we’re seeing, median price for closed single family homes in Lee County Florida remains at $185,000. This is the same number as officially reported in February. In other words, median prices did not increase in March. Average sale prices came in at $265,386 in March, down from February’s $311,536. While both numbers are higher than March 2013, they are the same or lower than February 2014. So what does this tell us? It tells us experts will be telling us how much better the market is this year because prices are up over last year, but it doesn’t give us perspective. 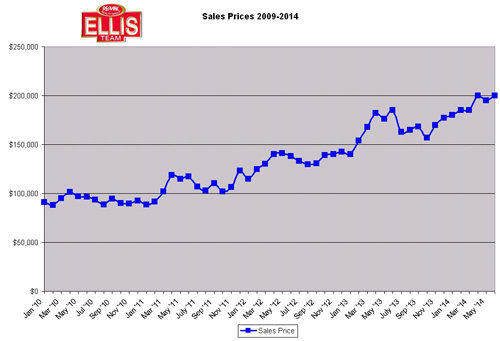 Typically prices begin an upward trend in February culminating around April-May, and sometimes June. This year we’re not seeing that. Season tends to set the trend for the rest of the year. For the past several years we’d see our big price gains during season then the market would ride the train for the rest of the year, typically with prices dipping back down a bit after season until the following season. If preliminary numbers for March pan out, we appear to be flat lining at a time when prices normally increase. It’s called seasonality of the market, and we’re not seeing the seasonality. If this trend holds true, our market may have peaked and retrench a bit later this year. Or, it could be a blip on the radar and mean nothing. I try not to read too much into data until a developing trend emerges. I do like to inform readers and agents as to some of the trends I’m watching. A good agent shouldn’t be tied to the outcome. Far too often I’ve seen agents make predictions and then choose data that supports their predictions. Right now we’re not predicting anything, just reporting some things we’re keeping an eye on. As a seller, this is information you might want to consider when pricing a home. We do similar analysis at the subdivision level as well, as all real estate is local and just because one area of the county is hot or cold doesn’t mean all subdivisions are at the same rate. Last week we posted a more complete analysis on our YouTube channel with graphs and trends you might find useful. Go to www.Youtube.com/brettellisfl to watch that video. Where is the market headed? Will it pick up steam or cool off in 2014? Nobody knows the answers, however we will keep you posted every step of the way. Knowledge is power. Not having knowledge can cost you money, both on the buyer and seller end. People think the value of a Realtor lies in their MLS data. Sure, you can search the MLS at www.Topagent.com. That’s not the value of a Realtor though. The true value is a Realtor’s ability to guide you through the tricky real estate maze and help you make the best decisions for you. We take that very seriously as do many full-time Realtors. Always hire an experienced agent. Finding out the hard way later on can cost you in more ways than you know. The Ellis Team is growing once again. We are proud to announce Ellis Team buyer specialist Dan Goczeski has joined our team as a buyer specialist. Dan was our Customer Care Specialist and Listing Coordinator up until last week, and we’re certainly going to miss him in that position. Dan has always had a passion for helping people and he certainly went the extra mile in his role at the Ellis Team. Dan has been a resident in Fort Myers for the past 30 years and is very knowledgeable about the area. He has witnesses first-hand what SW Florida has grown into today and he looks forward to helping others find their piece of paradise too. 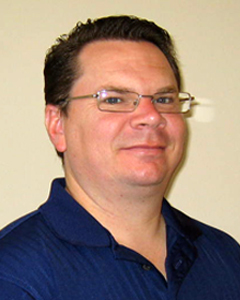 Dan has an extensive professional history from being a licensed financial advisor to a General Contractor in SW Florida. Dan has worked with clients in many fields, but customer satisfaction was always his top priority. All of these qualities are what makes Dan uniquely qualified to find just the right property for you. Dan saw how many buyer leads were coming into the team and it caused him to think about becoming a Realtor in SW Florida. He’s always been in a position advising clients in the building and financial services sectors, but he developed a sense of helping others in real estate through his experiences with the Ellis Team at RE/MAX. Once he saw how we help so many people it made an impact on him and he wanted in. So it is with welcome arms we welcome Dan Goczeski to our team of buyer Specialists. Congratulations! Posted in Cape Coral Real Estate, Fort Myers, Fort Myers Real Estate, Lehigh Acres, Southwest Florida Real Estate. The beautiful thing about advertising is that you’re free to choose which venues work for you. Some people complain that newspaper advertising is dead and costly, so they quit years ago. Others complain that Yellow Pages are dead and costly, so they quit that too. Many brokers are in a fight to get their website ranked as highly as possible to avoid paying advertising. SW Florida Real Estate Brokers Find Buyers in new ways. While getting ranked is important, search engines are adding more paid content to their front page, effectively squeezing out the free search results. There are fewer and fewer spots left on front pages eaten up by paid advertising. For those that believe newspaper advertising is dead, we can look no further than 2 weeks ago. I wrote an article entitled “Thinking of Selling” That weekend we had over 130 sellers sign in to our website to find out the value of their home. That’s quite a response. People believe we’re foolish to take out full page ads in the Yellow Pages. Yet each week we receive calls from buyers and sellers from the Yellow Pages. Some are visiting in hotel rooms. Others still use it at home. The real advantage may be the online component of Yellow Pages. Dex is a large advertiser that gets ranked on the first page of Google and Bing. If you’re an advertiser in print, you’re an advertiser online. The same goes with the Newspaper. You’re not just advertising here locally as Gannett covers many papers across the US. Our advertising philosophy can best be described as “Cornering the Market.” We use print, TV, Internet, radio, mail outs, etc. 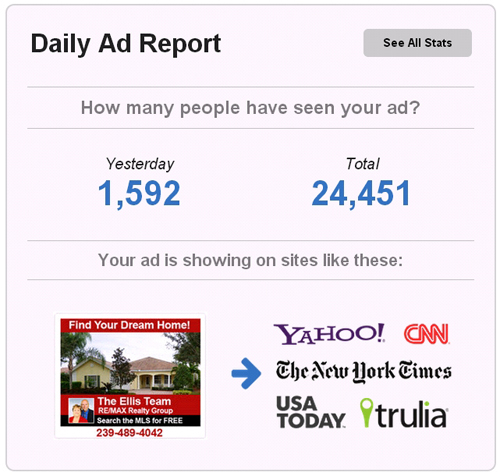 The Ellis Team advertises our listings online in sites like USA Today, CNN, Trulia, New York Times, Fox News, and many more. Relying on search engines is great if you’re looking to pick up a few buyers here and there on the cheap, but if you really want to market your seller’s property it’s worth spending money to reach buyers everywhere. Advertising isn’t expensive if it works. The newspaper still works. It costs money, but if you’re consistent and don’t try to cram too much into a small ad it’s effective. Yellow Pages work. Radio, TV, Internet; they all work. The trick is learning what’s effective. Certain ads work. You can’t blame the advertising medium if you post a crappy ad and nobody calls. When you’re interviewing real estate agents you have to ask pointed questions about where your home will be advertised and how often. It’s not rude. It’s your home and you’re paying the commission. If the commission includes advertising it pays to find out how much exposure your home will have versus other brokers. Many sellers assume all agents are the same when in reality brokers advertise differently. The brokers who advertise more may be better negotiators too because they’re spending more money on your home and they need to be.